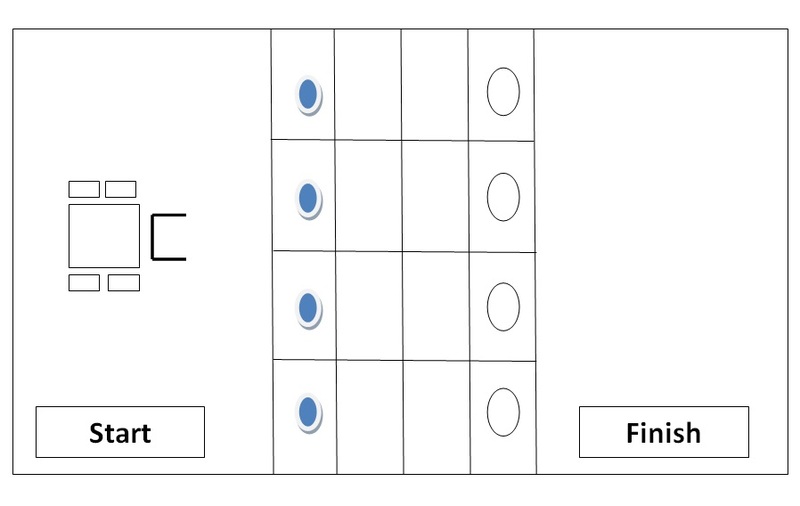 The object of this challenge is to move the 4 round objects (blue circle objects) to the other side of the grid board, along with the robot at the other end of the table(Finish). Each game object can only occupy one square at a time. If the robot accidentally moves two objects into the same square, the challenge is over and the countdown is reset. Each robot will have 60 seconds to complete the challenge. Each square is 12 inches by 12 inches. The robot can push, pull or bump the object into place. The game objects cannot exit the grid space! This is a math related problem; think hard before trying to tackle this problem.